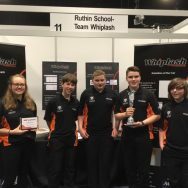 ‘Team Whiplash’ (Ruthin School’s development team in the ‘Formula 1 in Schools’) has had another successful year. 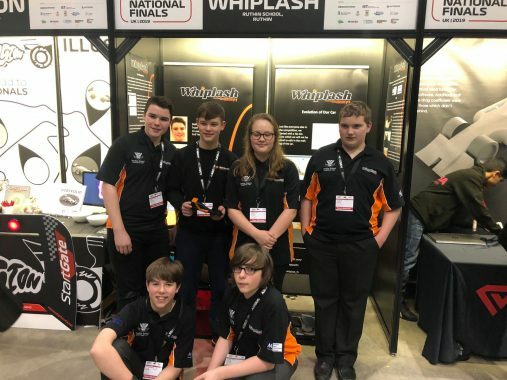 Through the help and support of their team members and teachers, they were able to successfully enter the regional finals, where they won first place and the best pit stop display award. The journey continued into preparation for the national finals and work was at an all-time high. They improved upon their learnings from the regionals to better their performance in the nationals. The Formula 1 in Schools Nationals was held in the Airbus factory in Broughton. This was an incredible experience for the team and after scouting out the competition and participating in interviews and presentations, they were taken on a full tour of the Airbus factory. Team Captain Steffan commented, ‘Not only has this experience taught us that complete strangers can work together as a team and produce something this amazing but it also proves that working together and working hard will provide some astonishing results. As always, there were many things to improve on and so we will set our heads on improving and redesigning our vision for the future.’ A big thank you to all the members of Team Whiplash, Dr. Fairbank, Mr Perry and Mr Owen-Booth for their help in achieving this accomplishment.